For the first time the Indian Premier League has scheduled the opening ceremony a day before the first cricket match and Bollywood stars are gearing up for the performances. Opening the night will be American pop star Katy Perry, who will perform to hits like Teenage Dream, Hot Cold and California Gurls. Stars like Amitabh Bachchan, Salman Khan, Kareena Kapoor and Priyanka Chopra are also set to perform on the opening night. 'Back from my second day of rehearsals .. Shaimak and his dancers, exceptional .. such a well trained and disciplined bunch ...!! They tell me Harbhajan Singh to Captain Mumbai Indians IPL team .. Sachin will play for team but does not want to be Captain .. !! The pain not so bad today, but still there .. spoke to doc, recommends some tablets for relief ..hope it lasts till tomorrow night !' 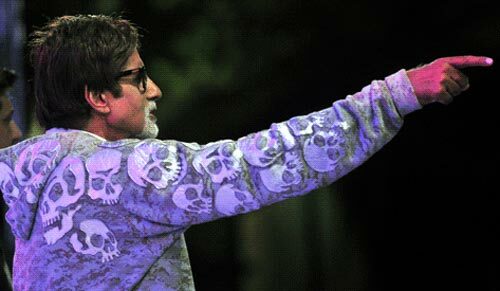 Amitabh Bachchan tweeted, with a picture (above). Neha Dhupia is also excited. 'When is the #ipl openin ceremony? Yes I'm a #cricket and #kateperry fan... N that's y m asking!' she tweeted. 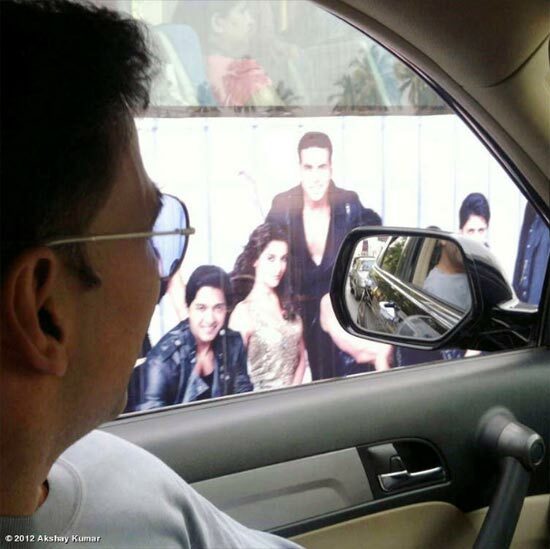 Akshay Kumar got nostalgic as he passed a bus promoting his film, Housefull 2. 'Even after over 20 years in this Industry, it never fails to make me smile when I see myself on the side of a bus that I once used to run after :)' he tweeted with the picture (above). Celina Jaitly, who gave birth to twins last month, returned to Twitter after a long time. 'Thank u for ur wonderful messages to welcome our twins Winston & Viraaj into this world @peterhaag n I feel blessed to have ur goodwill,' she tweeted. Zarine Khan is headed to Singapore for Housefull 2. 'En route Singapore for Hf2 premiere wid mom... Super excited !!' she updated. The film also stars Anil Kapoor, Kangna Ranaut, Zayed Khan and Sameera Reddy. It will release on April 27. 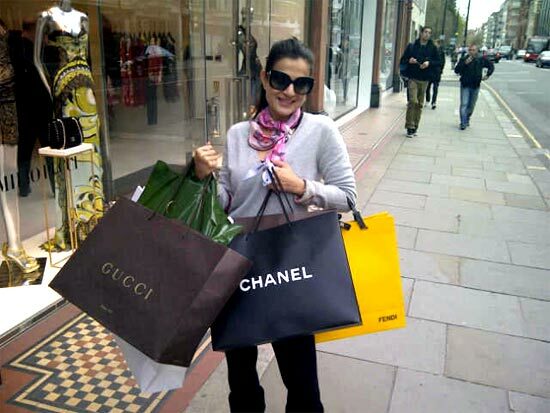 Ameesha Patel is having fun in London and shared a picture (above) to prove it. 'Successful shopping day in london..hahahaha,' she tweeted. Deepa Mehta shared a still of Kulbushan Kharbanda from her upcoming film Midnight Children. 'Kulbushan Kharbanda in #MC as Picture Singh, the most charming man in the world - an easy feat for the thespian,' she tweeted. Shabana Azmi shared a picture of her with feminist leader Gloria Steinem. 'Spent an eve with my heroine Feminist leader Gloria Steinem in Delhi today. She continues 2 inspire,' she wrote.